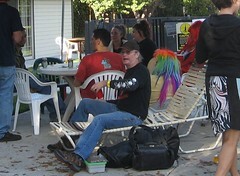 Here is a picture of an artcar friend, Tim. I met him and his wife Joanne in 2006 at the San Francisco Art Car fest. They are very cool people, and live in Portland. I have not been in touch with them since Fall 2006, but keep saying I should call them next time I'm in Portland. Me: "Is your name Tim?" Me: " You have a wife named Joanne?" Me : (now uncertain that I have the right guy, or fear that he and Joanne have split up): "you don't have an art car?" I apologize, say I thought you were someone else, Tim asks us for our floor and pushes the button, we exit. Me: "That was Tim Robbins, wasn't it?" The funny thing is, when I met Tim in 2006, I thought he looked like Tim Robbins, and asked him if anyone had ever told him that. He said no. And while I thought it somewhat implausible that someone who lived in PDX would have any reason to be in a hotel in PDX, it's certainly less plausible that Tim Robbins is staying in your hotel in Portland and appears in the elevator hours after you speak of Tim and Joanne. Paul, of course, recognized him immediately and was mortified when I approached him (until he realized who I thought it was). We saw him at the front desk Sunday as we checked out, and I thought about apologizing, but figured I'd already unwittingly crossed that line where non-celebrities are supposed to leave famous people alone when they're trying to be incognito and I should keep my distance to avoid further embarrassment. Hours later, wandering around Hawthorne past a shop specializing in things you can buy for your cat or dog, Paul overhears some hipsters whispering to each other "Hey, I think that was Tim Robbins" as a tall man enters the shop. So Tim (and Tim), I apologize. I'm really not the type of person to harass actors that happen to cross my path, but if you look at the picture (not a great likeness, but the only photo I have of Tim), I think you can see my error was genuine and not an excuse to be a creepy stalker. I bet that made his day! That's worse than when I knocked the hat off of Jeff Bridges' head when I was working at EMP. You know, I would think he'd actually appreciate it if someone didn't recognize him. Guess not. Oh wow. Please post a "missed connections" on Craigslist! You have too much Tim on your hands.